"This is how my mother in law makes beef stew and she is from Alabama. As southern as you can get. Do not use generic tomatoes, they make this bland. I use arm shoulder roast and cut it up cause some beef stew meat is too tough. You can also make this with turtle meat and call it turtle stew, that's what we do! You can adjust the ingredients according to your own taste. We love to eat this with buttered bread." Melt butter in a Dutch oven over medium-high heat. Add beef, and quickly brown on all sides. Pour in the diced tomatoes with green chilies, and stewed tomatoes. Add the okra, lima beans and corn. Bring to a boil, and reduce heat to medium. Simmer for about 1 hour. Add potatoes, and continue to simmer for another 30 minutes, or until meat is very tender. 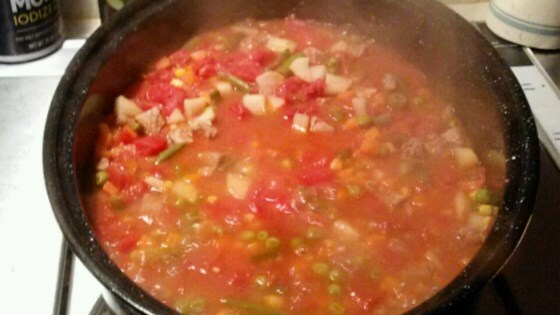 If you can find a frozen vegetable Gumbo mix, you may substitute that for the vegetables. Stew meat needs to be cooked at least 2 to 2 1/2 hours. Then it will be tender. Cook meat for about an hour and a half, then add all the vegetables and cook for another hour. ROLL TIDE! everything is better here in Alabama. great recipe. Certainly southern- and I know southern! If you were born and raised in Tennessee, Alabama, Georgia, or Virginia your whole family will love this delicous recipe!